It's incredibly simple to create a WiFi QR code for your network using the InvolvedWifi QR generator. When someone scans the QR code, a message will pop-up asking to connect to the right WiFi and automatically fill out the password. The QR code can be easily shared by printing on your menu, on a little sign in your conference room/waiting room etc. It's not limited to password protected WiFi networks, free public networks like InvolvedWifi guest WiFi can also profit from QR codes. This way your guest won't have to scroll through all available networks and prevent them by clicking on the wrong one. 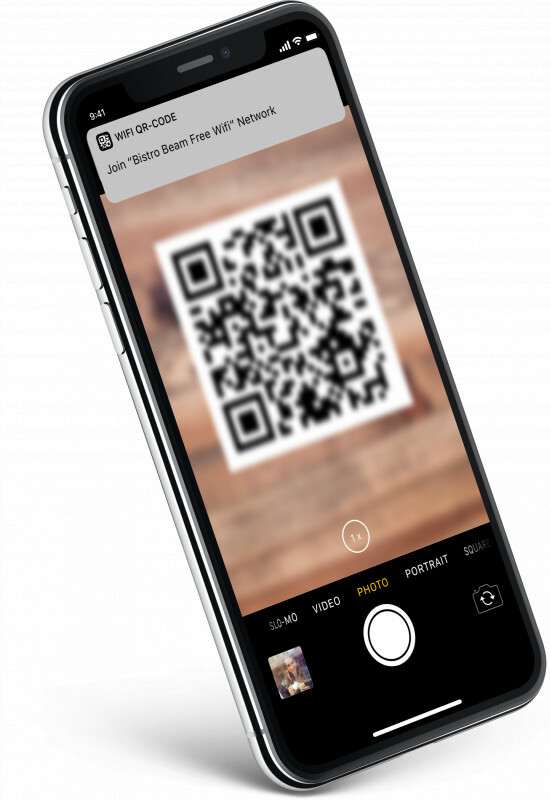 Many smartphone brands (like Apple since iOS 11) support scanning QR codes natively through the photo camera app.